You are here: Home / Skincare / Exfoliation / How Do Tough Guys Cleanse Their Skin? Von Miller Style! How Do Tough Guys Cleanse Their Skin? Von Miller Style! This is something you don’t see every day—a football superstar getting a shave. 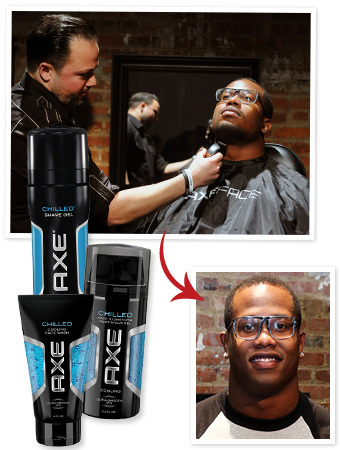 Alas, that’s what we witnessed at the New York launch of Axe’s first men’s skin range, Axe FaceScore, where Denver Broncos linebacker Von Miller showed off his love for grooming by getting a shave in front of dozens of beauty editors. “I didn’t think I needed skincare,” he told InStyle.com before sitting down with the razor. “During the season, I’m pretty much a Viking! Taking care of my face allowed me to show my individuality, and you need extra hydration in a dry environment like Denver.” The range includes a shave gel, face wash, and post-shave gel in three formulas to suit sensitive, oily, and tired-looking complexions, all priced from $5 to $9. And, of course, they all include “that Axe smell”—the one your little brothers, cousins, and teen kids know so well. “I think guys will automatically gravitate toward Axe Face since a lot of us have been using the body sprays for years,” said Miller. “Plus, it may increase chances with the ladies just a little bit.” Aw, every “Viking” has a softer side—it’s all about the girl, and we’re taking notice. « Cool Merpeople, Melusine, Selkie, and Siren Pictures!